The Crochet Crowd actually has done some really amazing tutorials on the most important basics. I learned using these two videos. I do not, however, enjoy their stitch tutorials that come after these two videos, because I believe there is a better way to teach this. Personally, I think it’s a lot harder to break a habit than to just learn it the way you want to learn it to begin with and there is a lot of good information out there in a lot of different places. My goal is to put it all together so that you don’t have to run around like I did to get the best information, so don’t go skipping forward and wait for the next lesson in the order I’ve compiled it. It WILL pay off! Basically, I’m handing you a year of trial and error, and putting it in the order that you need to learn it and handing it to you in one full package and saving you the trouble that I had to go to. You’re welcome! I also hope to teach you the same techniques in a few different ways so you aren’t caught off guard, like I was, when you see something done differently in a pattern. I was so confused by this for a long time and when I saw someone do it another way than I learned, I got little alarm bells that said “Hey! They’re doing it wrong!”, when really, they just knew a better way. So just remember if you see someone doing something in a way you don’t understand that there is more than one way to skin a cat. The first two videos here are 12 minutes and 15 minutes long, the others are all 2, 3 or 5 minutes. Each are worth watching for different reasons. Please watch them in order. This is the longest part of the learning process. Play with your new hook and yarn and see if you can complete some of these. You'll want to play a little each day this week with these videos handy. This is the other reason I don't want you moving forward and searching on your own for a minute, is because if you're doing that, then you're not thinking about the lesson at hand. Master this first! These are The Crochet Crowd Super Basics and in my opinion, the BEST way for a new beginner to learn. There is no wrong way. These lessons are not to make anyone feel badly for the way they do things, which is why I made sure to include as many different correct ways to do things as possible. In my opinion, I feel like the Crochet Crowd way, (the first video) is the best way for new learners to learn. Especially since those who crochet using the way the crochet crowd video shows you (and it's a wonderful video for a lot of reasons) can use the same hold and move easily over into knitting and not have to change the way they hold yarn or the needles. (Quick knitting trivia: Knitters hold their yarn in their right hands. 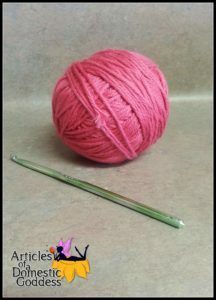 Those who crochet most commonly translate over as what is called "continental knitters" which is a fancy way to say they hold their working yarn in their left hand, like crocheting.) There is no way to hold a knitting needle in the grip hold, you must hold it vertically. So this is why I feel the first way is good to translate into knitting easily. But if it just feels really wrong, any way you can hold it your crochet hook and comfortably make the stitch is fine. If you're a beginner, practice making your slip knot, practice holding your yarn and practice chaining! Try to make your tension even; not too tight- not too loose and even the whole way. And when you're done with that, pull it and try again! Do nothing else but start and chain this week. You need this ground work because we will be adding the stitches next week. At this point, you should have no problems at all following and completing this pattern, this pattern or this pattern!